Setting up a bagel bar is the perfect fuss-free breakfast or brunch solution for easy entertaining! Everyone loves bagels! 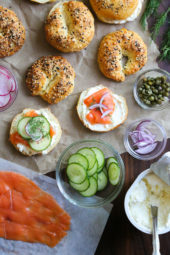 A bagel bar party is the easiest way to serve breakfast or brunch for a crowd! You can buy fresh bagels or make them yourself with my homemade bagel recipe for the ultimate bagel bar! Buy lots of spreads and toppings, set them out on pretty trays or boards, make some mimosas, coffee, fruit and let everyone help themselves! This is great for any gathering – Christmas Morning, New Years Day, Mother’s Day brunch, Father’s Day Brunch, Easter brunch, etc! A bagel bar menu can be as simple or as elaborate as you wish. 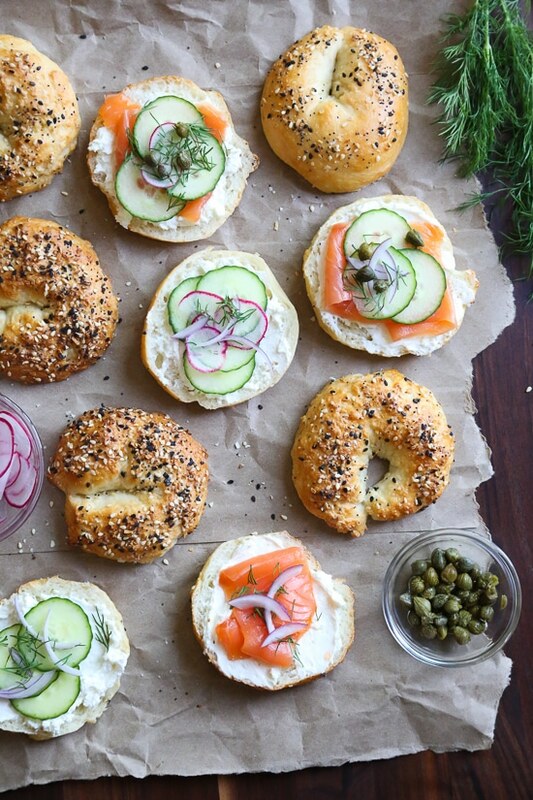 These bagel bar ideas will inspire you for your next brunch. 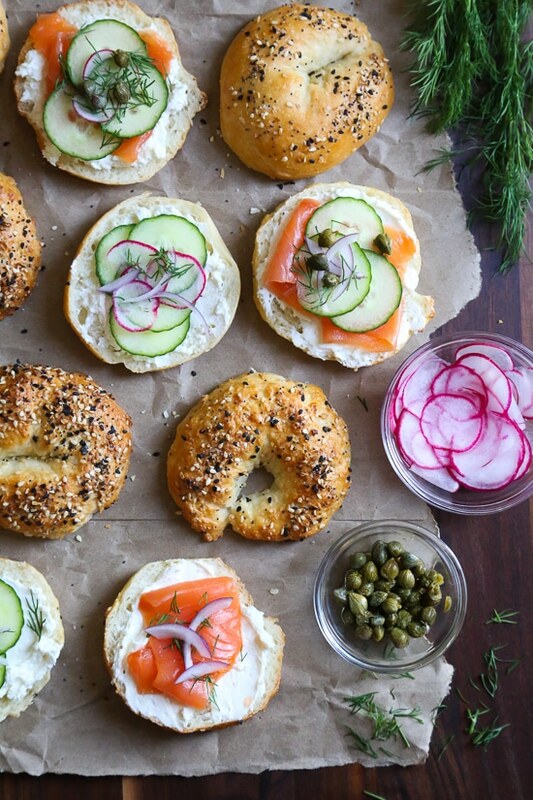 Start with homemade bagels if you have the time! If not, no worries you can buy fresh bagels the same morning you plan on having your breakfast or brunch. Make or buy a variety! A batch of plain is a must but I always include whole wheat, sesame, everything, onion, egg, cinnamon raisin, etc! If you make them yourself with my homemade bagel recipe, the sizes are perfect for one. If you plan on buying them, you can cut them in half or buy mini bagels. Keep a toaster handy for those who like a toasted bagel. If you are making the bagels, find the recipe here. If you are buying them at a bagel store, plan to pick them up early the day you are serving them so they are fresh. Head out to the store and pick up all the fixins a day or two ahead. Set the bagels out on boards or platters with all the toppings and beverages and let everyone help themselves. Awesome presentation for this nice treat! The jam looks tasty. Can the dough be made the night before in advance? Love the ideas for a spread,could eat this anytime of day. These are helpful postings when trying to think up ideas for entertaining. I just made the bagels for the first time and am so impressed with how good they are. I found everything bagel seasoning at “tea and spice company” and can order on line if can’t get to one. I made my bagels minis too 8 instead of 4 for a recipe,. Turned out just fine, I did cook them 25 minutes, thought it might need less but kept checking and they looked like they could handle the extra time. I have made your bagels and they are delicious! But yours look bigger than mine so I am wondering what Diameter yours come out to be be? It could be the photo? They are like the size of a Lenders bagel. 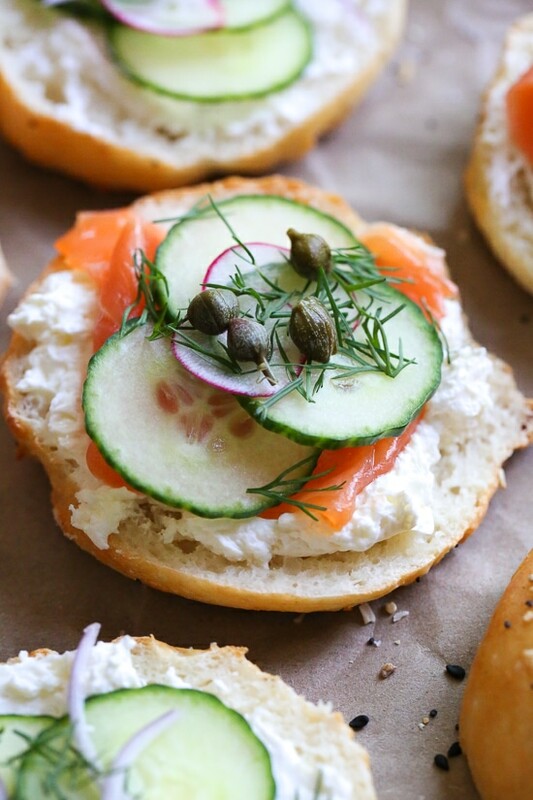 I was just thinking about a winter brunch I’ll be doing in the new year- and I was planning on doing smoked salmon and bagels! You have definitely given me more ideas for it! Thank you. I am definitely going to try this. Will bake as I don’t have an air fryer. Are you using TJ ET bagel seasoning in the video?